The term has come in for a lot of scorn. But it’s because we haven’t been clear about what it actually entails, argues Helen Walters. Ladies and gentlemen, let me break this to you gently. Design Thinking, the topic we’re here to analyze and discuss and get to grips with so you can go back and instantly transform your businesses, is not the answer. First, some context: Until July of 2010, I was the editor of innovation and design at Bloomberg BusinessWeek. Before that, I’d worked consistently in design journalism both here in New York and in London. The reason that I wanted to join BusinessWeek in the first place was precisely because it struck me as being the one place that had its eye on both camps, on the creative industries and on the business world writ large. And it struck me that it’s at this nexus and intersection that the thriving businesses of the future will be built. I joined the magazine back in 2006, which was a time when design thinking was really beginning to take hold as a concept. My old boss, Bruce Nussbaum, emerged as its eloquent champion while the likes of Roger Martin from Rotman, IDEO’s Tim Brown, my new boss Larry Keeley and even the odd executive (AG Lafley of Procter and Gamble comes to mind) were widely quoted espousing its virtues. Eager onlookers were left baffled about replicating this success. Still, in the years that have followed, something of a problem emerged. For all the gushing success stories that we and others wrote, most were often focused on one small project executed at the periphery of a multinational organization. When we stopped and looked, it seemed like executives had issues rolling out design thinking more widely throughout the firm. And much of this stemmed from the fact that there was no consensus on a definition of design thinking, let alone agreement as to who’s responsible for it, who actually executes it or how it might be implemented at scale. And we’d be wise to note that there’s a reason that companies such as Procter & Gamble and General Electric were held up time and again as being the poster children of this new discipline. Smartly, they had defined it according to their own terms, executing initiatives that were appropriate to their own internal cultures. And that often left eager onlookers somewhat baffled as to how to replicate their success. This is something that I think you need to think very carefully about as you look to implement design thinking within your company. Coming up with ways to implement this philosophy and process throughout your organization, developing the ways to motivate and engage your employees along with the metrics to ensure that you have a sense of the real value of your achievements are all critical issues that need to be considered, carefully, upfront. Designers often bristle when the term design thinking comes up in conversation. It’s kind of counterintuitive, right? But here’s why: Having been initially overjoyed that the C-suite was finally paying attention to design, designers suddenly became terrified that they were actually being beaten to the punch by business wolves in designer clothing. Design thinking captures the qualities that drew designers to the field. Suddenly, designers had a problem on their hands. Don Norman, formerly of Apple, once commented that “design thinking is a term that needs to die.” Designer Peter Merholz of Bay Area firm Adaptive Path wrote scornfully: “Design thinking is trotted out as a salve for businesses who need help with innovation.” He didn’t mean this as a compliment. Instead, his point was that those extolling the virtues of design thinking are at best misguided, at worst likely to inflict dangerous harm on the company at large, over-promising and under-delivering and in the process screwing up the delicate business of design itself. So let’s be very clear. Design thinking neither negates nor replaces the need for smart designers doing the work that they’ve been doing forever. Packaging still needs to be thoughtfully created. Branding and marketing programs still need to be brilliantly executed. Products still need to be artfully designed to be appropriate for the modern world. When it comes to digital experiences, for instance, design is really the driving force that will determine whether a product lives or dies in the marketplace. Design thinking is different. It captures many of the qualities that cause designers to choose to make a career in their field, yes. And designers can most certainly play a key part in facilitating and expediting it. But it’s not a replacement for the important, difficult job of design that exists elsewhere in the organization. The value of multi-disciplinary thinking is one that many have touched upon in recent years. That includes the T-shaped thinkers championed by Bill Moggridge at IDEO, and the I-with-a-serif-shaped thinker introduced by Microsoft Research’s Bill Buxton, right through to the collaboration across departments, functions and disciplines that constitutes genuine cross disciplinary activity. This, I believe, is the way that innovation will emerge in our fiendishly complex times. Just as design thinking does not replace the need for design specialists, nor does it magically appear out of some black box. Design thinking isn’t fairy dust. It’s a tool to be used appropriately. It might help to illuminate an answer but it is not the answer in and of itself. Instead, it turns up insights galore, and there is real value and skill to be had from synthesizing the messy, chaotic, confusing and often contradictory intellect of experts gathered from different fields to tackle a particularly thorny problem. That’s all part of design thinking. And designing an organizational structure in which this kind of cross-fertilization of ideas can take place effectively is tremendously challenging, particularly within large organizations where systems and departments have become entrenched over the years. You need to be prepared to rethink how you think about projects, about who gets involved and when, about no less than how you do things. The way that you approach innovation itself will probably need to change. This might seem like a massive undertaking, but if you’re after genuine disruption more than incremental improvement, these kinds of measures are the only way to get the results that you need. Design thinking is not a panacea. It is a process, just as Six Sigma is a process. Both have their place in the modern enterprise. The quest for efficiency hasn’t gone away and in fact, in our economically straitened times, it’s sensible to search for ever more rigorous savings anywhere you can. But design thinking can live alongside efficiency measures, as a smart investment in innovation that will help the company remain viable as the future becomes the present. The disconnect between the design department, the D-suite, if you will, and the C-suite is still pretty pronounced in most organizations. Designers who are looking to take a more strategic role in the organization, who should really be the figures one would think of to drive these initiatives, need to ensure that they are well versed in the language of business. It’s totally reasonable for their nervous executive counterparts to want to understand an investment in regular terms. Fuzziness is not a friend here. And yet, as I’ll get into in a moment, sometimes there’s no way to overcome that fuzziness. Leaps of faith are necessary. But designers should do everything they can to demonstrate that they have an understanding of what they’re asking, and put in place measurements and metrics that are appropriate and that can show they’re not completely out of touch with the business of the business, even if they can’t fully guarantee that a bet will pay off. Designers were quite happy to bask in their new status. The two worlds of design and business still need to learn to meet half way. Think of an organization in which design plays a central, driving role, and there’s really only one major cliché of an example to use: Apple. But what Apple has in Steve Jobs is what every organization looking to embrace design as a genuine differentiating factor needs: a business expert who is able to act as a wholehearted champion of the value of design. In other words, Jobs has been utterly convinced that consumers will be prepared to pay a premium for Apple’s products, and so he’s given the design department the responsibility to make sure that every part of every one of those products doesn’t disappoint. He is also notorious for his pickiness. I’ve talked with Apple designers who say he would scrap a project late in the game in order to make sure something is exactly as he thinks it should be. Now I don’t know about you, but how often does a project come back and it’s not quite how you wanted it but it’s okay and it’s really too late to make the changes to make it great and so you go with it? I know I’m guilty of doing that. Jobs doesn’t countenance that approach. And he’s set up processes to ensure that problems are caught, early, and the designers have enough time to get back to the drawing board if necessary. This commitment to excellence has helped turn Apple into the world’s most valuable technology company. Note too Jobs’ approach to customer research: “It isn’t the consumers’ job to know what they want.” Jobs is comfortable hanging out in the world of the unknown, and this confidence allows him to take risks and make intuitive bets that for the past decade or so have paid off every time. And he’s instilled this spirit in his team. New company leader Tim Cook is renowned for the creative way in which he worked on supplier issues. So now we get into something of a problem of terminology, because more than likely, Steve Jobs doesn’t consider Apple’s approach to be “design thinking”. Yet he’s the consummate example of one who’s built an organization on its promise. This approach of risk taking, of relying on intuition and experience rather than on the “facts” provided by spreadsheets and data, is anathema to most analysis-influenced C-suite members. But you need this kind of champion if design thinking is to gain traction and pay off. I once heard a discussion between the current director of the Cooper-Hewitt museum, Bill Moggridge, and Hewlett Packard’s VP of Design, Sam Lucente. Sam was talking about how design thinking had helped him and his team to redevelop the design of one particular product that had done badly in the marketplace in order to produce a later, more successful version. The way he told the story, design thinking meant that this couldn’t be seen as a failure, because every moment had been one of wonder and learning. My interpretation was initially a little less poetic, that in fact design thinking no more guarantees the success in the marketplace of a product than any other tool or technique. But actually, reframing failure in terms of learning is not just a kooky, quirky thing to do. In and of itself, it’s perhaps a useful exercise. By taking the pressure off design thinking and not expecting it to be the bright and shiny savior of the world, those trying out its techniques will be empowered to use it to its greatest advantage, to help introduce new techniques, to give new perspectives, to outline new ways of thinking or develop new entries to market. Reframing failure in terms of learning is not just a kooky and quirky. 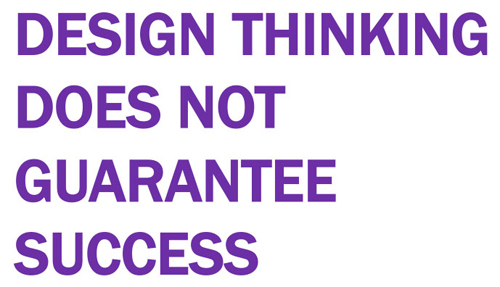 In fact, I would argue, beware the snakeoil salesmen who promise you’ll never take another wrong step again if you buy into design thinking. While some executives have been running their businesses according to its principles for years now, the formal discipline is still pretty new, and individual companies really have to figure out how it can work for them. There’s no plug and play system you can simply install and roll out. Instead, you have to be prepared to be flexible and agile in your own thinking. You’ll likely have to question and rethink internal processes. For there to be a chance of success, you’re going to have to ascertain what metrics you want to use to judge whether a program has been successful or not. And you’re going to have to figure out how to allocate resources to make sure that an initiative even has a chance of taking off. I know some of you are familiar with the work and thinking of Doblin’s Larry Keeley, with whom I’m working now. For a long time, Larry has been at the forefront of the movement to transform the discipline of innovation from a fuzzy, fluffy activity into a much more rigorous science. His thinking in that arena holds for design thinking too. It’s time to move beyond the either/or discussions so often entertained within organizations. This isn’t about left brain vs right brain. This is about the need for analysis and synthesis. Both are critically important, from data analytics to complexity management to iteration and rapid prototyping. But even with all of this, there’s never going to be a way to 100% guarantee success. The goal here is to be able to act with eyes wide open, to have a clear intent in mind and to have systems in place that allow you to reward success and quickly move on from disappointment—and to make sure that your organization learns from those mistakes and thus does not repeat them.